In some of the site’s earliest days, we covered New Jersey’s Delicate Steve, then a mysterious and talented rock and roll newcomer, as he played to ever-increasing local crowds and rising buzz three years in a row. It’s been about four years since Steve last played Music City, however, and just as long since his last LP. Thankfully, we’re thrilled that not only is the project back with a highly-anticipated new album, This Is Steve, but are also set to make their Nashville return March 13 at The High Watt, along with locals Microwave Mountain. Tickets are available right here, and if you missed out on Delicate Steve when he first popped, you should really get to know him this time around. We’re so excited that we’re even giving away a pair of tickets to one lucky fan, so read on for more about the lineup and enter below! Both the live moniker of and the name of the band fronted by New Jersey native Steve Marion, Delicate Steve erupted onto the scene shrouded in mystery with their debut album, Wondervisions, in 2011. Written and recorded entirely by Marion, a gifted and prolific songwriter and multi-instrumentalist, author Chuck Klosterman was tapped to craft an entirely fictional bio without even listening to any music, leaving Steve’s record to speak for itself, as press and fans tried to sort out the project’s obviously fabricated and enigmatic backstory. Buzz did quickly spread, and soon Delicate Steve became a breakout indie act, gaining even more attention with 2012 sophomore effort Positive Force. With associations, collaborations, contributions, and praise from artists as diverse as David Byrne, Dirty Projectors, tUnE-yArDs, Mac DeMarco, Dr. Dog, Built to Spill, Death Grips, Tame Impala, and Paul Simon, Delicate Steve’s proggy, folky, poppy, timeless sound has managed to defy genre and scene, enhanced by fantastic guitar work and meticulously crafted compositions. After more than four years, the band’s latest and third album, This Is Steve, serves as a triumphant and long overdue return, and harbors a sharper focus and more refined sound that’s sure to satisfy old fans and win over plenty of new ones. Relatively new to the local scene, Microwave Mountain are the brainchild of Utah transplant Jamie Timm, who, like Steve Marion, performed every part on 2015 debut Shades Up. Also like Delicate Steve, Microwave Mountain have adopted a full band live, and you’ve probably seen their name on an increasing amount of bills lately, as their psych-tinged, lo-fi, garage rock sound serves as a perfect compliment to a wide range of acts. Winner will be announced Thursday, March 9 at 5 p.m. CST, and will receive one pair of tickets. Good luck! 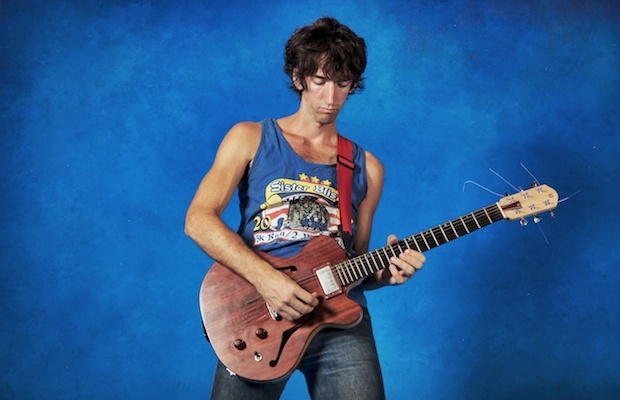 Win Tix to Delicate Steve at The High Watt! Delicate Steve and Microwave Mountain will perform Monday, March 13 at The High Watt. The show is 18+, begins at 8 p.m. (doors at 7 p.m.), and tickets are available to purchase for $10-12.